“Reduce, Reuse, Recycle” is one of my favorite slogans. 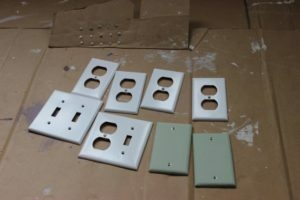 Of the three, “reuse” is probably the most difficult to incorporate, because getting something new is generally more enjoyable and many times just a whole lot easier. I have always found fun in scrounging up items for a Halloween costume or a play costume, but I am challenging myself to reuse and repurpose as often as possible in day-to-day life. I found a couple of opportunities to do so this past week. and gave them (and all of the screws) a couple of quick coats. The second project involved this wool jacket I bought during our trip to Alaska last year. 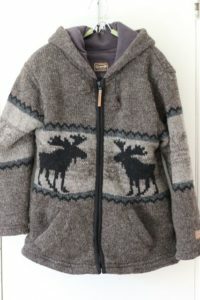 I had admired the jacket at a couple of shops in Talkeetna. It was warm and it was beautiful; it was also out of my price range. Back at our lodge, the same jacket – in my size – was on the clearance rack, marked down about 60% due to a defect. Upon close inspection I noticed that a single tooth was missing from the zipper, but it still worked perfectly. Score! What I did not notice until I got home was that the sleeves were slightly shorter than I prefer. With gloves on, if I bent my arms there was a little bit of wrist exposed. I hate that. For a year the jacket hung in the coat closet. A couple of weeks ago Phil asked me when I was going to wear it, so I decided it was time to fix the sleeves. Problem was I had no idea how. My first idea was to knit a pair of cuffs, but I had no yarn that would match, nor did the local yarn stores. My second idea was to harvest the cuffs of an old sweatshirt, but I did not have anything in the right color and I did not think the textures would look right. But that idea led me to remember a wool sweater of Phil’s that had recently been subjected to an unfortunate accident. Bad thing about wool sweaters – they shrink when they are run through the dryer. Funny thing about wool sweaters – they don’t shrink proportionally width- and length-wise, so a shrunken sweater won’t fit anyone. 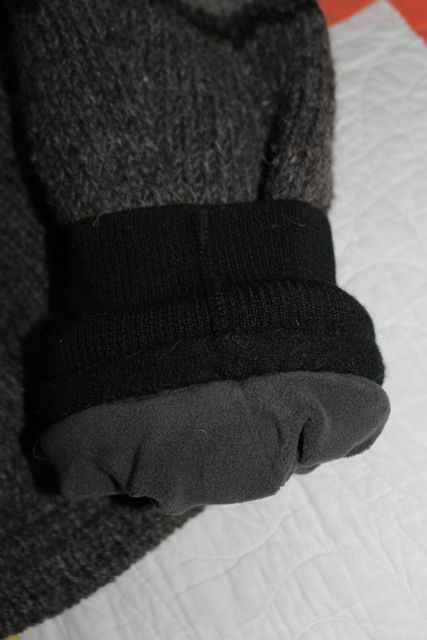 Great thing about wool sweaters – they have cuffs! I had been thinking about brown cuffs to match the overall color of the jacket. Phil’s sweater was black, but the cuffs had shrunk just enough to fit snugly around my wrists so I decided to use them. 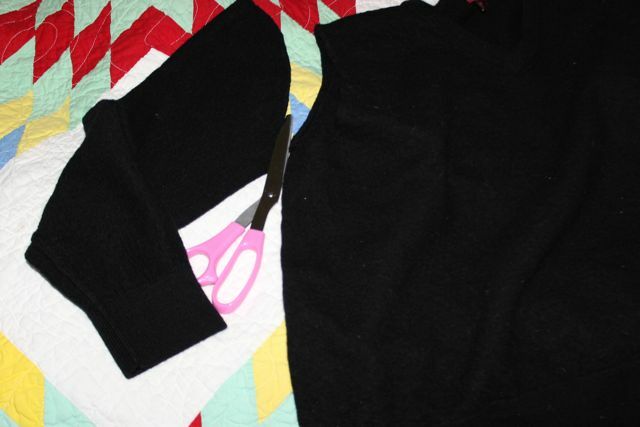 The first – and hardest – step was to cut the sleeves off of the sweater. Silly, since the sweater was not going to do anyone any good. 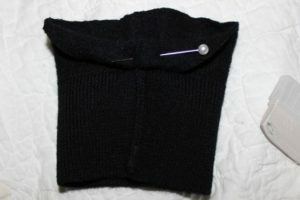 Next, I measured 1.5″ up from the edge of the cuff, folded it over twice and loosely hemmed around the top folded edge. I might have been able to skip this step since the wool turned into felt in the dryer, but I prefer the neater look of a hem. I stretched the hemmed top edge of the cuff around the bottom edge of the jacket sleeve, aligning the side seams, and sewed the cuff into place along the hemline already in the jacket sleeve. Here’s the result. No more drafty cuffs! 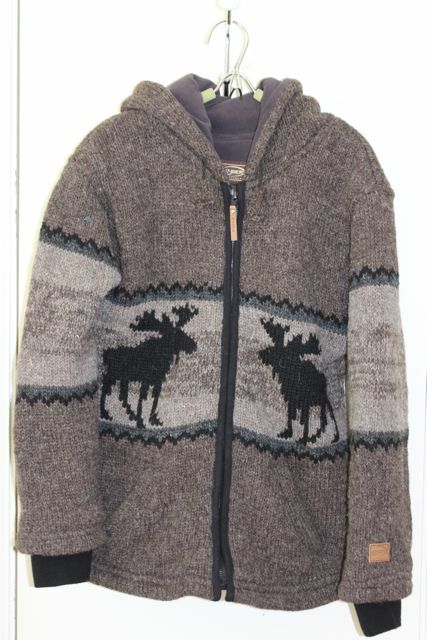 Since the jacket and cuffs are both wool and the color of the cuffs matches the moose motif, it looks like the jacket could have come this way. Best of all, my wrists stay warm! In no way should this post be interpreted as permission to use plastic grocery bags as a substitute for suitcases. That is just tacky, my friends. Repurpose the grocery bags to line the bathroom trash can. Better yet – stop collecting plastic bags and use reusable ones. I promise to overlook it if you use one of them as a suitcase. The Hunger Games: Catching Fire is scheduled for release this Friday. In preparation, I watched The Hunger Games again. I was reminded of a few points that I thought worked really well in the film adaptation and a few more that fell flat. Be forewarned that this review contains spoilers, so please stop reading now if you have not yet seen the first film. I understand the need to streamline the number of characters for the movie adaptation. Axing Madge was one thing, but the new backstory of Katniss’ mockingjay pin is ludicrous: Katniss finds the pin at the marketplace and gives it to li’l sis Prim as a good luck charm to protect Prim from anything bad happening to her at the Hunger Games reaping. Prim is selected despite her name being entered only once in the pool. Katniss volunteers to take her place and when Prim comes to say goodbye, she gives the pin back to Katniss to protect her from anything bad happening. Really, Prim? Fifteen minutes ago the mockingjay pin proved itself to be an epic failure as a good luck charm and you are giving it back to Katniss? 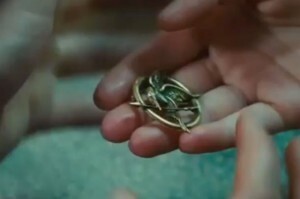 And Katniss, you are accepting it? 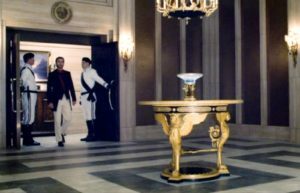 My suggestion: It would have worked better for Mrs. Everdeen to give Katniss the pin when she and Pris came to say goodbye. She could have told Katniss the story about it having belonged to a friend of hers who was a tribute years before and she hoped it would bring Katniss luck. 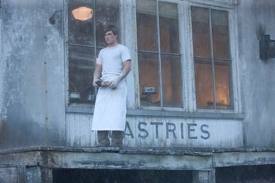 In the book, the scene where Peeta tossed a loaf of burnt bread to Katniss occurred shortly after the death of Katniss’ father more than five years earlier. Katniss is a little girl nearly starving to death. The scene does not make sense once Katniss is a young woman proficient at supporting herself and her family by hunting in the woods outside of District 12. My suggestion: it would have worked better to cast a couple of younger actors to film this scene. The tracker jacker scene is critical to the story, but I did not care for the way it was executed. Seeing Katniss’ point of view as out of focus was all right, but having Caesar Flickerman walk into her hallucination with an explanation of the effects of tracker jacker venom was incongruous, and the explosion of her cabin just did not make sense. My suggestion: Caesar Flickerman’s comments could have been handled as a quick cutaway to the Hunger Games program instead of part of the hallucination. Leave out the exploding room. In the book, the mutts sent to pursue the last few remaining players had facial characteristics of the dead tributes. The film version generic mutts were not nearly as menacing as the picture the book painted in my imagination. My suggestion: Stepping up the CGI to make the mutts look more like the slain tributes could have been a truly terrifying scene. Since the book was written strictly from Katniss’ point of view, we did not know anything at all about the Hunger Games control room. 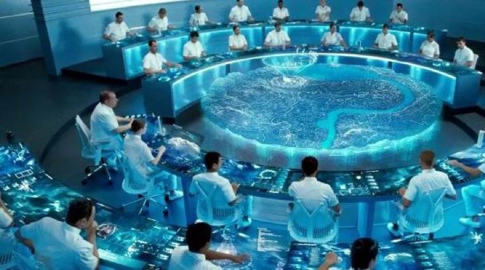 The depiction of the control room technology in the movie, particularly in contract to the condition of life in District 12, was outstanding. I also liked the parachutes that delivered sponsor gifts (although I had always imagined them as silent – seems like the tinkling sound could attract the unwanted attention of other tributes). 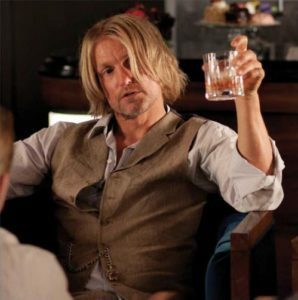 When Woody Harrelson was cast as Haymitch, I remember thinking it was a particularly brilliant choice. And it was. Overall, I think the casting directors did an outstanding job bringing the novel characters to the screen. 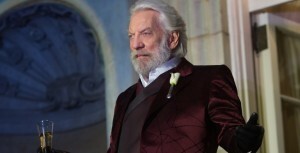 In the books, President Snow does not make an appearance until Catching Fire. It worked very well to introduce him earlier on, particularly for the pre-game festivities. This is another scene that was not possible from Katniss’ first person narrative in the novel but was a splendid addition to the movie. 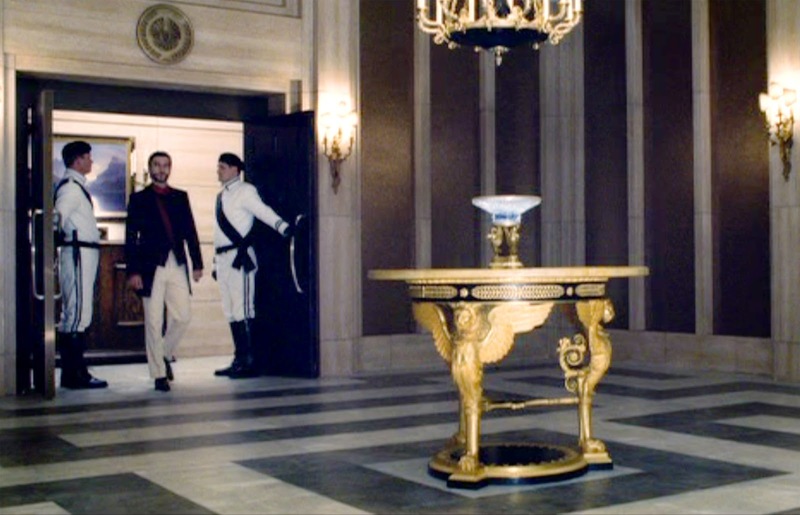 Watching Seneca Crane approach a bowl of lethal nightlock berries in an otherwise empty yet opulent room – and realize its implications – sent chills down my spine. Overall, I thought the filmmakers did an excellent job adapting the movie to film, and I am looking forward to seeing what they did with The Hunger Games: Catching Fire. A few years ago, Laura got hooked on braiding friendship bracelets. She quickly learned to follow intricate patterns that left me completely lost. One day as I searched for new patterns online, I came across an interesting variation called kumihimo. Originating in Japan during the eighth century, kumihimo (“gathering of threads”) developed into an extremely beautiful and useful art form. Its original purpose was to lace together plates of samurai armor and embellish swords. Some warriors could be identified by the unique intricate patterns of their kumihimo cords. 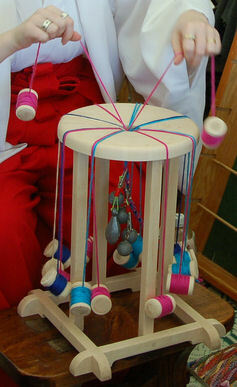 Kumihimo braids were later used to fasten the obi (wide sash) around a kimono (traditional formal Japanese dress). 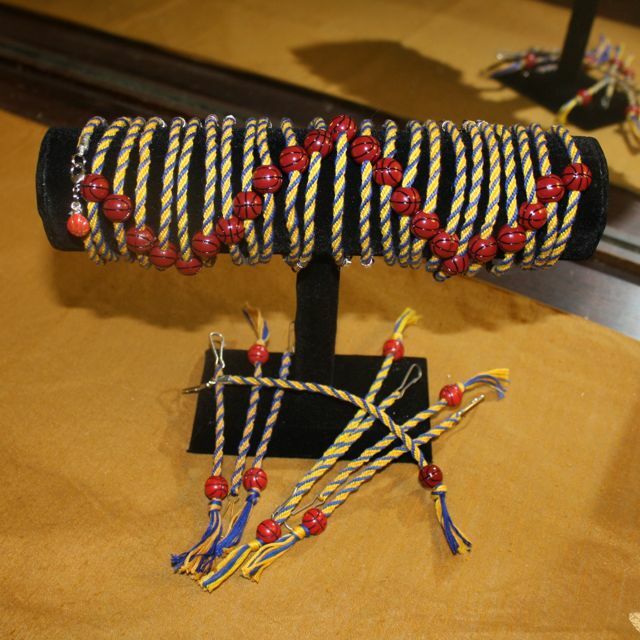 Today kumihimo is used for many purposes, including beautiful jewelry. 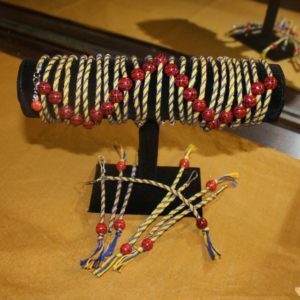 Historically braided from pairs of silk threads on wooden looms known as marudai, some patterns have been adapted for braiding on foam disks with slits to hold the threads. I found the repetition of the kumihimo patterns to be very calming. I especially liked a pattern known as ridged spiral, and decided to utilize it in gifts for Laura’s basketball team a couple of years ago. My pattern was featured in the What a Knit May 2012 newsletter. Space constraints caused the pattern to be significantly condensed, so I am publishing the full version here for those interested. Unwind and find the midpoint of each skein of embroidery floss. 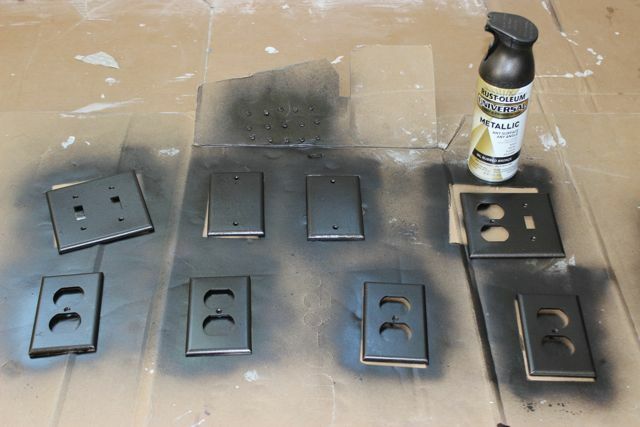 The main color will start in slots 32 & 16 and 1 & 17. The background color will start in slots 6 and 22, 7 and 23, 10 and 26, 11 and 27. 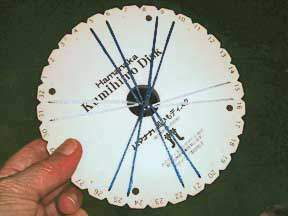 Center the floss on a foam kumihimo disk and wind the ends onto fold-over bobbins. Once all six skeins of floss are prepared, put a lanyard end around the intersected strands of floss, and hang a weight on it. Braid in the ridged spiral pattern until the main color runs out. (Note: This pattern may be found on page 21 of Makiko Tada’s Comprehensive Treatise of Braids VI: Kumihimo Disk and Plate. There are online instructions at http://www.weirdollsandcrafts.com/none/round3.html. If you prefer a visual tutorial, see http://www.youtube.com/watch?v=zGZL7qpkdNI (it’s in Spanish but has English subtitles and is easy to follow). Remove the braid from the disk and gently stretch it. I found that each complete rotation around the disk makes 1” of braid, and six skeins of standard embroidery floss yields 60 – 66” of braid. Use a floss threader to string about 12 beads onto the braid. (I usually pull 2-4 strands of floss through the beads at a time.) Extra beads are easily removed at the end of the process, but near impossible to add after the first bracelet is cut. Cut segments to 6.25” (for a 7” bracelet) making sure there is a bead on each segment before you cut it. (Adjust the segment length for longer or shorter bracelets.) Glue on the end caps. When the glue has dried, add split rings and lobster claw clasps to attach them. Leave a bead on the leftover braid with the lanyard end to make a key fob for the coach. Tie an overhand knot at the desired length and unravel a bit of braid for a short tassel. Repeat as necessary for the number of bracelets and key fobs needed for your team. My daughter gave these to her teammates and coaches at Christmas and they loved them! Even before Laura made her appearance 0n Thanksgiving Day, it was one of my favorite holidays. I love the family-orientation of the day, the spirituality of thanking God for all of the blessings I enjoy, and of course leftover turkey and pumpkin pie. 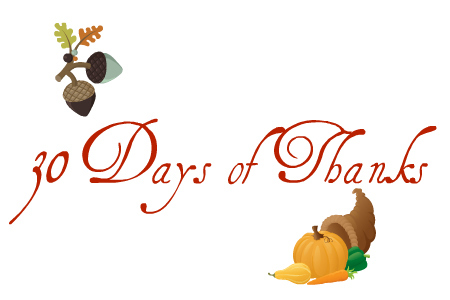 I am participating in Thirty Days of Thanks on Facebook. I did so last year as well, and looked forward to coming up with something new for each day. 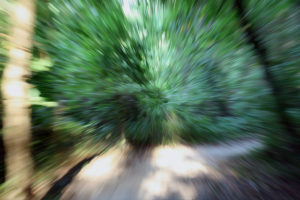 This year I plan to add a photograph to accompany my thought for each day. I hope to come up with mostly new gratitude items, so I am listing last November’s posts here to refresh my memory. 2 – I am thankful for our superhero pets, Epileptic Dog and Psychotic Cat. 3 – I am thankful for a lovely home in a nice neighborhood with good neighbors. 4 – I am thankful for my church family that values and supports Christian education and provides a vibrant youth program. 5 – I am thankful for opportunities to travel. This week’s web log: Part I of a series on our trip to Vietnam. 6 – I am thankful, so very thankful, so very extremely thankful, that it is Election Day in the United States. Not only is the secret ballot a cornerstone of our democratic republic, but the robo calls will stop as well. Be sure to vote today if you are eligible and able! 7 – I am thankful for my HFS and AN friends who have provided invaluable support and encouragement over the past 4.5 years. I can’t list everyone, but you know who you are. Thanks and God bless. 8 – I am thankful for the beautiful autumn weather we are having here. I am keeping my friends and others on the east coast who aren’t so fortunate in my prayers. 9 – I am thankful for the excellent educational opportunities we have been able to provide for our children. Trinity Lutheran School, Helias High School, Jefferson City Public Schools, and Truman State University have all been blessings to us. Jefferson City has so many excellent options. Calvary Lutheran High School and Lighthouse Preparatory Academy are also top-notch schools and there is a strong home school association. I also neglected to mention all of the dual credit through Lincoln University. SO MUCH TO BE THANKFUL FOR! In the interest of full disclosure, thanks for St. Louis Downtown Children’s Center, Jefferson City Day Care Center, JCPS Preschool and Presbyterian Preschool as well. 10 – I am thankful that my super tall and skinny boy finally fits (at least for the present) in an off-the-shelf size. I am further thankful that Orscheln had jeans on sale this week for $11.99. How often does that happen? 11 – I am thankful for service and sacrifice of the United States armed forces: past, present and future. 12 – I am thankful to have never experienced real hunger. A post for fellow foodies this week – Vietnamese cuisine. 13 – I am grateful for my publisher and editor. I am further thankful that after five years, my Arch Book story is still featured in the CPH Christmas catalog. 14 – I am thankful that my adult siblings and I get along so well. I know that is not the case in all families. 15 – I am thankful for the public library. Also that Missouri has such a great interlibrary loan system, MOBIUS. 16 – I am very thankful this morning that I was able to nurse our pathetic puppy dog through a bout of gastric distress without a three-digit visit to the veterinarian. 17 – I follow a number of heartbreaking stories on Caring Bridge. I keep each one of them in my thoughts and prayers. I am thankful that my children are healthy and happy. 18 – I am thankful for the flame of a vivid sunset, the flamboyant tint of the flamingo, the blush of a rosebud and every shade in between. I am thankful for slobbery dog kisses and baby cheeks and handmade knit hats and all of the other little things that make pink my favorite color. 19 – I am thankful for eighteen years of wedded bliss. Happy Anniversary, Phil! 20 – I ♥ GIRLS BBALL! Today (although sorely disappointed to miss tonight’s season opener for the Helias Lady Crusaders) I am thankful that basketball season is underway. Having endured my share of frigid soccer matches and sweltering tee ball games, I am thankful that basketball is an indoor sport. I am exceptionally grateful to Laura’s coaches for their dedication and sacrifices – Rodney Hart, Mark Murphy, Brent Fischer, Debbie Mo Rosslan, Thayne Barton, Alan Lepper, Sarah Kempker, Grant Berendt and Doug Light. I am thankful for TLS Little Tigers Camp, Faith Lutheran and YMCA basketball leagues, Helias, Jefferson City High School, Mizzou and Jason Otter basketball camps, the Jefferson City PAL League, LSAM State Tournament and LBAA Lutheran National Tournament. I wish successful and injury-free seasons for all of the former TLS Lady Tigers who still pound the court: Madison and the Lady Jays, Shelby and the Lady Wildcats, Kara and the Lady Lions and especially Laura and the Lady Crusaders. 21 – Two things today: first, i am thankful that the Lady Crusaders opened their season with wins for both junior varsity and varsity. Congratulations! Second, I am thankful that the steroid shot to my foot is working as advertised. Lots on the to-do list today. Wishing everyone a wonderful blessed day. 23 – I am thankful that Laura Beth Hartman joined our family seventeen years ago today, our very own Thanksgiving baby. Hanna had asked for a little brother but had to wait almost two more years for Joseph to show up. 24 – Here in the post-Thanksgiving weekend, I am grateful for appliances: for refrigerator, stove, roasters, washing machine, and especially dishwasher. They certainly facilitate living, much less feasting. 25 – I am thankful for technology. Old technology, like a radio to listen to the station championship football game even if one can’t attend. New technology, like the internet, which pretty much allows one to visit anywhere in the world without leaving home. 26 – I am thankful for digital photography. I remember limiting the number of photos I took with a film camera because film and processing were so expensive, and probably missed a lot of great shots. With a digital camera I can take as many photos as I would like, keep the best ones and delete the rest. 27 – As the weather progresses toward wintry, I am thankful for warmth – for furnaces, space heaters and wood-burning stoves; for down comforters, wool socks and flannel lined jeans; for heated leather car seats. 28 – I am thankful for the police and fire departments. 29- I am thankful for art and music and literature and poetry and humor and the entire spectrum of ways that human imagination and vision enrich our lives. 30 – On this final day of November thankfulness, I am grateful to God for all He provides, summed up nicely in Martin Luther”s explanation of the first article of the Apostle’s Creed: I believe that God has made me and all creatures; that He has given me my body and soul, eyes, ears, and all my members, my reason and all my senses, and still takes care of them. He also gives me clothing and shoes, food and drink, house and home, wife and children, land, animals, and all I have. He richly and daily provides me with all that I need to support this body and life. He defends me against all danger and guards and protects me from all evil. All this He does only out of fatherly, divine goodness and mercy, without any merit or worthiness in me. For all this it is my duty to thank and praise, serve and obey Him. This is most certainly true.